Join us for a weekend or a week. 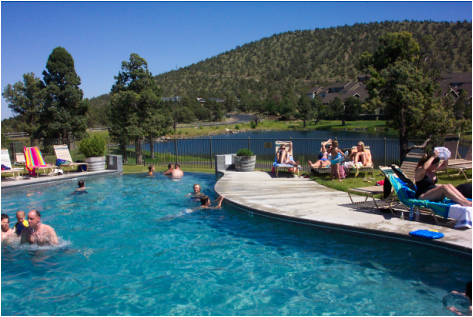 Enjoy the Fun, Friendship and great food of Eagle Crest Resort. Sign up with your friends or family by calling Jim or Polly today at (503) 658-3850 for affordable details and a weekend full of great memories. Week long vacations are available at group or family rates. Our newest sports program is called: "Tennis With a Slice of Life". We take small groups of 4-8 adults or parents with their children, to enjoy a weekend getaway at Eagle Crest Resort near sunny hills of Redmond, Oregon where the sun shines 300/days a year. Although we started with tennis as our main draw, our Sports Weekend can include: hiking, horseback riding, swimming, basketball, golf, biking, racquetball, soccer, or skiing at Mt. Batchelor during winter months. Some weekends are for adults only and some are for children with a parent. Call Jim for price and dates available. At your request we will also include our Saturday evening group discussion on practical principles related to everyday issues we all face. See list of topics below and more resort pictures. 1) Eagle Crest Resort, Redmond, Oregon. Weekend Getaway of 2 nights & 3 days. Includes organized tennis Friday, Saturday and Sunday. Extra tennis is on your own. Limited to 4 players OR larger groups of 6-12 players. Lodging will be either in the resort Lodge or two bedroom condos. Call Jim for rates. 2) Jim's Tennis Center, Damascus, Oregon. Overnight (Friday/Saturday or mid week Tuesday//Wednesday) . One over night stay at Jim and Polly's home & two daytime tennis sessions of 2-5pm on the first day and the following morning of 11-2pm. Format: 2 - 4 players. Over night accommodations for 2 people only, includes two separate bedrooms & 1-1/2 bath/shower. Limited to one player per room. Dinner anywhere (suggested cuisine at the quaint Italian restaurant in Sandy, Oregon). 15 minutes away called: "Trattoria Sapori"
Their website: trattoriainsandy.com. (trattoria in sandy.com). Breakfast at Pub 212 (5 minutes away). Call Jim for rates. 1) "How to Keep from Beating Myself During Competition and in Life"
2) "How to Overcome a Moody and Independent Spirit"
3) "If God is good, why is there so much suffering in the world?" 4) "Learning to Forgive a Parent or Family member for Mistreatment." 5) "How to establish solid Financial Habits and Stay out of Debt"
6) "Principles on How to Find God's Choice in Marriage or Stay Single"
7) "How to Find One's Purpose for Existence"
8) "How to Motivate your Child by Not Living Your Life Through Your Kids"
9) "Learning to Live by Principles instead of Impulse". 10) "How to Avoid Bad Friendships"
11) "How to Keep Away from Drugs and Alcohol"
12) "Ten of the most tricky questions asked by atheists and agnostics." 13) "How to overcome hostile college professors who promote atheism and agnosticism." OR How to go through college without losing your faith. 14) "Why Darwin's theory of evolution is losing followers in academic circles." Click on each small picture below to enlarge.